Best Rated Cordless Stick Vacuums (2018-2019) – This is a roundup of the best cordless stick vacuums currently available. Cordless stick vacuums are lighter than traditional upright vacuums and free you up from having the hassle of cords and looking for electrical outlets. They do have a limited runtime, and smaller dust cup than a regular full size upright vacuum. Cordless stick vacuums do have enough power to clean carpets or bare floors, and most have a motorized brush roll. There are cordless stick vacuums that have a detachable handheld vacuum which allows you to clean smaller areas, such as stairs, upholstery, and cars. Cordless vacs use a variety of different battery technologies. Lithium ion and Dyson’s Nickel Manganese Cobalt batteries are the best battery technology, for energy density, and faster charging. The new 2018-2019 Dyson Cyclone V10 Absolute cordless vacuum is our top cordless vacuum, and has won the Best of 2019 Award. 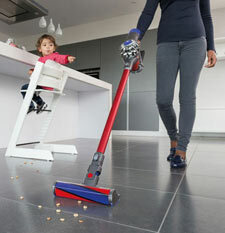 The Dyson Absolute vacuums have HEPA Filtration, and both have a new soft roller hard floor tool. They have the power of an upright, but weigh less than 6 pounds. Below are the top rated cordless vacuums, listed with top features, prices, differences between models, and reviews. **Note: Battery Runtimes are maximum per battery. Some vacuums come with more than one battery. The Dyson V10 is the best cordless vacuum on the market, and has won our BEST of 2019 award. This Dyson cordless model will not only give you longer battery life, but the larger dust bin allows you to clean longer without filling the bin. 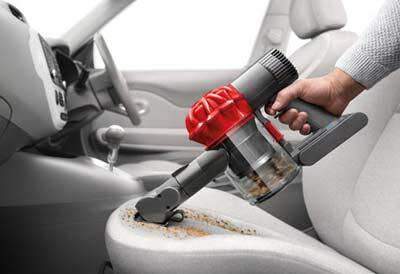 The best new feature is a dust ejection system which cleans and scrapes out any dust, all in one action. The Motorhead floor tool also has increased power for cleaning rugs and carpets as well as a corded upright. New suction controls have been added. All of this in a lightweight vacuum that weighs less than 6 lbs. This latest edition of Dyson cordless vacuum has the best suction of any cordless vacuum with Whole Machine HEPA Filtration. Includes the Docking Station, Mini Soft Dusting Brush, Motorized Floor Tool, Fluffy Soft Roller Hard Floor Tool, and Mini Motorized Hand Tool (for cars, upholstery, and pet hair). 2 Tier Radial™ cyclone & Root Cyclone™ = Dyson uses a patented method of spinning the dust and dirt so it goes into the bin and not the filter. The filter does not get clogged with dirt & dust like other cordless vacuums do. Dyson offers a lifetime filter on its cordless vacuums. The 2 Tier Radial™ cyclone is Dyson’s newest technology available in the Dyson V10 Absolute. This is Dyson’s top cordless, and has received the Smart-Review Best of 2019 award. 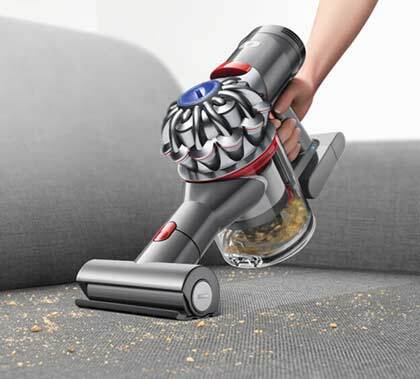 Maximum Runtime = The number of minutes this vacuum can run at its lowest setting on its battery. On/Off Brushroll = This feature allows you to turn off the brushroll. This would be useful when vacuuming hardwood floors. Multi-Floor Brush = This refers to the Dyson brushroll. It is designed to be used on different floor types such as carpets, hardwood, tile, and other surfaces. It is different than other cordless vacs in that it has carbon fiber elements for hardwood, and nylon bristles for carpets. Quiet Cordless Vacuum = With our testing, we have found the Dyson V10 Series to be the quietest cordless vacuum to date. 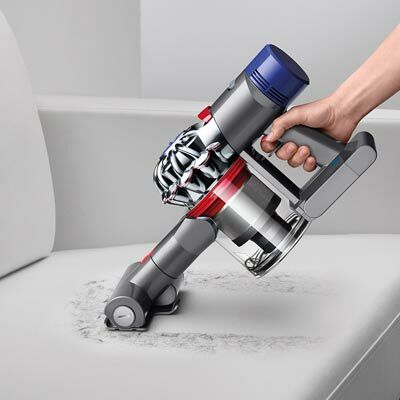 Dyson claims that this model is 50% quieter than the previous V6 models. Floor & Carpets = These type of cordless vacuums can operate like an upright vacuum on both hard floors and carpet (even deeper pile carpets). All of these types have a motorized beater bar which is best for deeper carpet cleaning. Floor & Low Pile Carpets = Cordless vacuums of this type will be best on hardwood floors, tile, etc, but will do best only on low pile carpets, and not plusher or thicker carpets. These cordless stick vacuums are different in that they do not have a beater bar brush. Which Cordless Vacuum is best for Pet Hair? 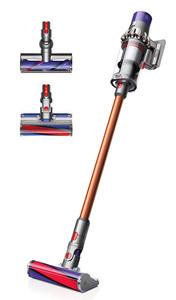 = Look for those cordless vacs with the strongest suction (best for hardwood floors), such as the Dyson V6 Series. For getting pet hair off of carpets, look for a motorized brush bar (Hoover Air Cordless, & the Dyson Dyson V7, V8, and V10 Cordless Vacuums). For getting pet hair off of upholstery and car seats, look for a cordless with a motorized hand tool (Dyson V6 Animal or Absolute). The Hoover Air Cordless is also a good cordless vac for carpets. Which Cordless Vacuum is best for Carpets? = Without exception, the Dyson V10 Absolute Cordless, and the Dyson V7 Animal Cordless are the best cordless stick vacuums for carpets. All these models have a Motorized (Motorhead) Floor Tool with with a direct drive motor and more power than previous versions. It was tested by Dyson against the 5 leading corded uprights, and outperformed them. It even outperformed a Dyson corded vacuum. 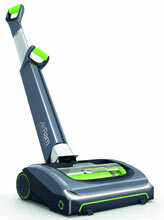 The new V10 Absolute has the most suction power, and most advanced Motorhead tool of all the vacuums. Converts to Handheld = This cordless vacuum is actually two vacuums in one. Its an upright stick vacuum, and if you need it, a handheld vacuum can be detached from the body. What Cordless Vacuum is best for Hardwood Floors? 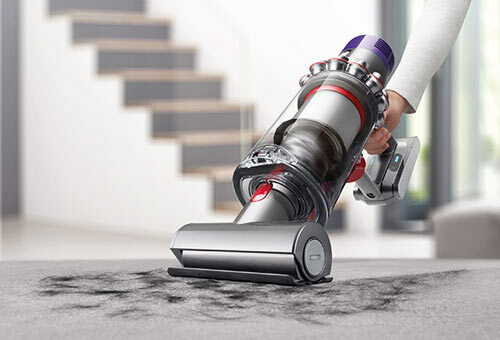 = For pickup on hardwood floors, the entire Dyson V7, V8 and V10 Series have the best pickup because of strong suction, but also has carbon fiber elements on the brushbar that can pick up tiny particles of dust and dirt, even from cracks and gaps in the floor all without scratching the wood. 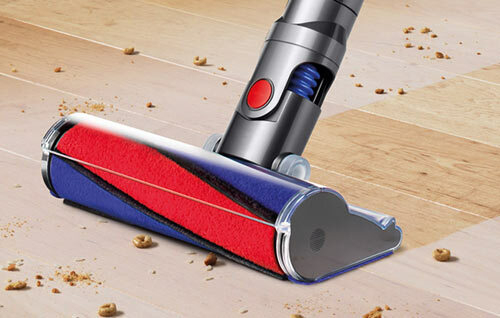 The best overall pickup of large particles (such as pet food, cheerios, cereal) and fine dust goes to the Dyson V8 Absolute and Dyson V10 Cyclone Absolute , which comes with the new Fluffy Soft Roller Floor Tool, the best hard floor tool on the market. The lower priced Bissell Air Ram Cordless is also good for hardwood floors, with its suction seal system. Battery Type = The chemistry of the batteries that power cordless vacuum. A Ni-Cd (Nickle Cadmium) battery is the cheapest type of battery, with some disadvantages of losing runtime as they are used. NIMH (Nickle Metal Hydride) battery, is the same type used in cordless phones (superior to Ni-CD). Nickel Manganese Cobalt Battery are a better version Lithium Ion, and can store more power (They are in the entire Dyson V7, V8 and V10 Series). Lithium Ion are one of the best types of battery. They store more power for the same weight as NIMH, this type is used in cell phones. Lithium Ion batteries also charge faster than NIMH and Ni-CD batteries. The Hoover Air Cordless comes with two lithium ion batteries, giving it the longest runtime. Bagless Stick Vacuum = A bagless vacuum stores dirt and dust in its onboard dust bin which is detachable. To take the dust bin to your trash can, to empty it. You do not need to purchase bags. Some you will have to clean the filter from time to time. Allergen Filter = An Allergen filter will remove the small particles of dirt, dust, and pet hair so that you don’t breathe in what you are vacuuming. This is especially important for those with allergies. Whole Machine HEPA Filtration = Only one currently available cordless stick vacuum has HEPA filtration, that is the Dyson V8 Absolute Cordless vacuum. The V8 HEPA filters and sealed system Remove 99.97% of particles as small as 0.3 microns. This is best cordless vacuum for those with pets or allergies. Cyclonic = Cyclonic vacuums lift dust in the dust bin, and prevent the filter from clogging. This applies only to Bagless vacuums. 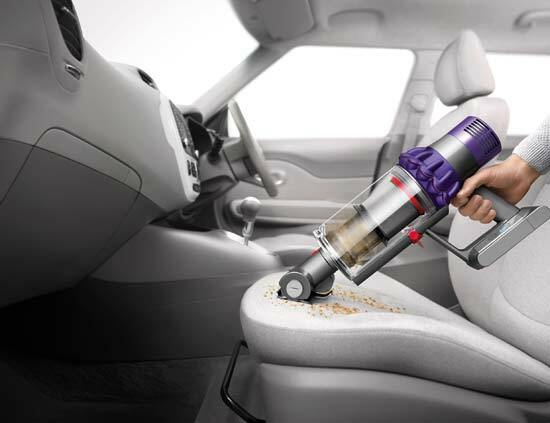 Mini Motorized Tool = Dyson Animal and Absolute Cordless Stick Vacs include an electrically powered mini motorized tool to vacuum upholstery, car seats, and other areas. This is especially useful for removing pet hair. 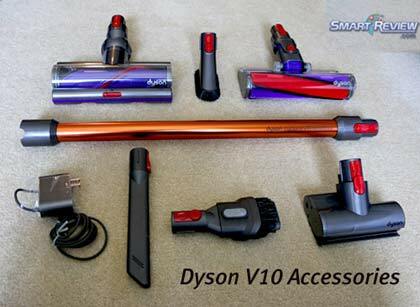 The Dyson V10 Animal, the Dyson V10 Absolute and the Dyson V7 Animal cordless vacuums include the Mini Motorized Tool. LED Headlights = Some cordless vacuums come with LED lights to see dirt and items you don’t want to vacuum in dark areas. Only the Hoover Air Cordless, the Shark IONflex DuoClean Cordless Vacuum, and the Bissell Air Ram Cordless comes with LED headlights.